Rembrandt is by far Amsterdam's most famous painter. While he was actually born in the city of Leiden - 45km south of the capital - Rembrandt didn't really start his career as a painter until he moved to Amsterdam, where he gained great fame and fortune - only to lose it all before his death in 1669. Locations around Amsterdam were prominent in his work, and on a walk around the city you're sure to stumble across the settings of some of his most famous paintings. Rembrandt is widely respected and admired by the Dutch, and ever since I really opened my eyes and started appreciating art, it's been clear to me why. There are simply very few painters that could capture the light, shades and detail that he could. His art, and he himself, have since played a major role in Dutch culture, figuring in Dutch movies and books. And there are countless streets, buildings, cinemas and schools that have been named after him. A trip to Amsterdam isn't complete without a visit to the world-famous Rijksmuseum, which exhibits art from the Middle Ages to the present day, and houses many of Rembrandt's great works, including The Night Watch. 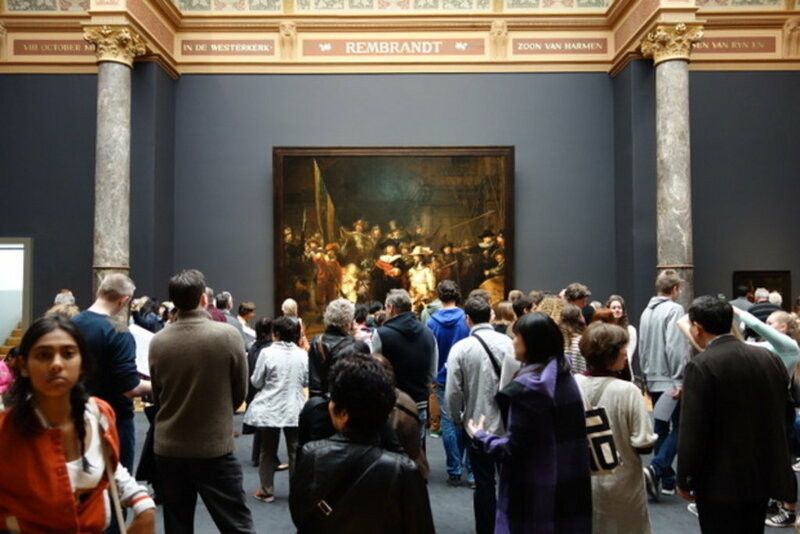 Seeing them with your own eyes is something special, but for an insider experience, wander beyond the museum's walls and discover Rembrandt's Amsterdam. On a walk around the city, see the settings of some of his most acclaimed works, and the places that were most important in his life. What better place to properly kick off the walk than to visit the man himself? 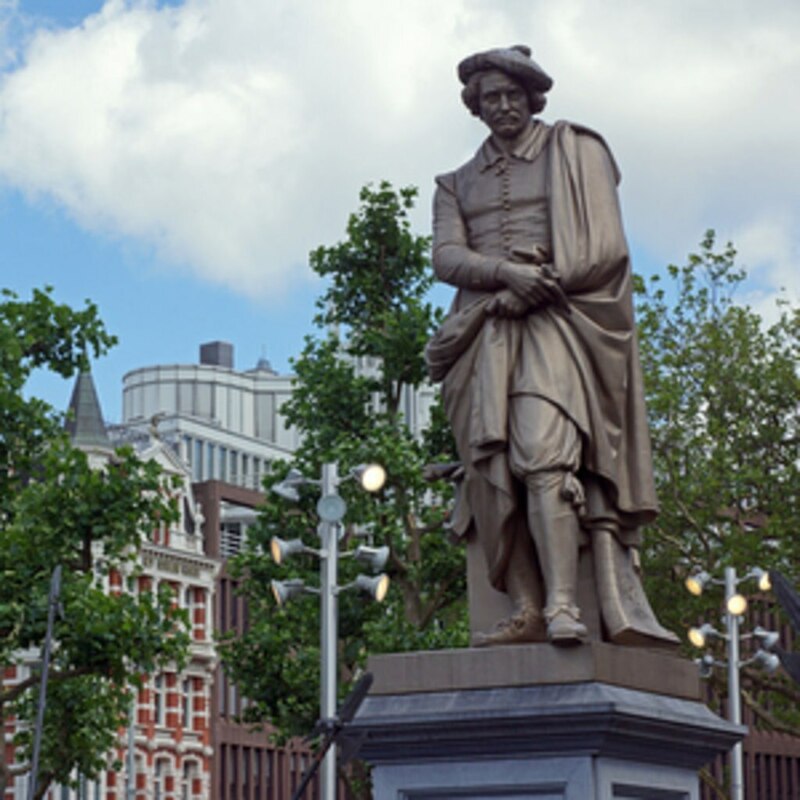 On the square named after him stands a large statue of the painter, surrounded by the characters of his most famous painting: The Night Watch. The statue was installed in 1852, after which the square was officially named Rembrandtplein in 1876. The square itself, though named differently, would have been built in Rembrandts lifetime. Jan Six, an important cultural figure in Amsterdam and a close friend of Rembrandt, lived in this mansion along the Amstel River. In 1652, Rembrandt immortalised him in a portrait. Three hundred and fifty years later the Six family still lives in the house, and continue to own the portrait, which occasionally gets loaned to museums. Marvel at the expensive mansions along this stretch of the canals. Just a little stroll along you will find the Blauwbrug (blue bridge), which is surprisingly un-blue. Rembrandt used to stand on this bridge and draw the city, looking south. 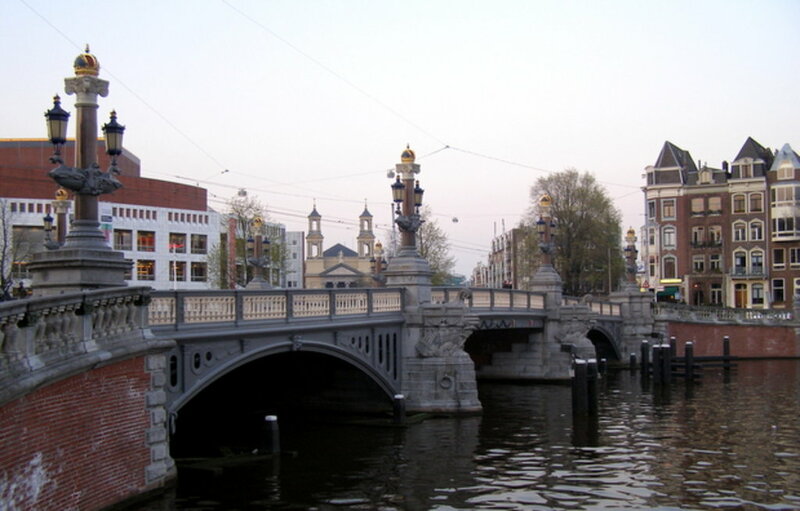 In the 1600s a blue, wooden bridge connected the two sides of the Amstel to each other. In 1883, this bridge was replaced by the new bridge, which heavily draws on Parisian architecture. With its regular markets, this is now one of the busiest squares in Amsterdam. From 1637-1639, Rembrandt and his wife Saskia lived in a house on the square, named 'Suyckerbackery' (Sugar bakery). Back then their neighbours would have been immigrants - mostly Portuguese Jews - as it was a popular area for them to settle. 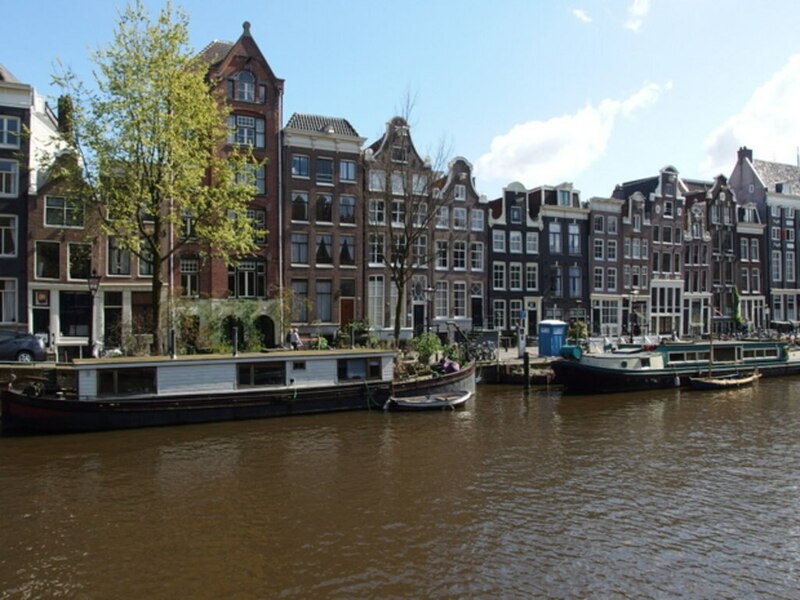 Just around the corner, you'll find the Rembrandthuis museum. After moving away from the Waterlooplein, Rembrandt, who was a highly sought after painter at that time, wanted a bigger, fancier house. He bought this one, which was surprisingly not located on a canal. Sadly, he paid too much for it: 13.000 guldens. Despite his success, he couldn't or wouldn't pay the mortgage, which got him into big debts. He was declared bankrupt in 1656. His possessions and the house itself were auctioned off, and he moved out in 1658. On this corner, that now houses the café with the same name, 'Het Staalhof' would have been located. This area was the centre of Amsterdam's textile industries, and Het Staalhof was the headquarters where government officers would come together to inspect the quality of the textiles. Rembrandt captured this scene in 1662. The painting hung in the building until 1771, when it moved to the city council, and finally the Rijksmuseum. Wander along the canals, and if you'd like to hang a love lock, you can do so just one bridge south. 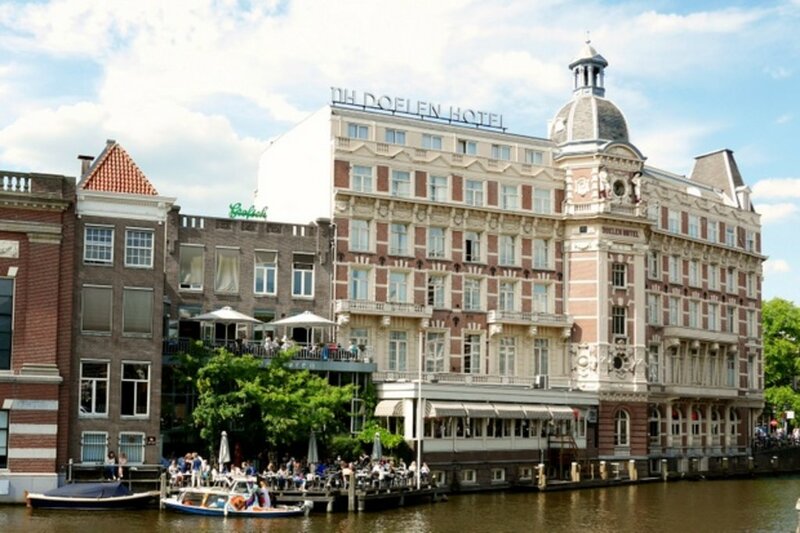 This hotel, adorned with two characters from 'The Night Watch', used to be the headquarters of the shooting company. The painting was commissioned around 1639 by the head of the company. Rembrandt was paid 1600 guldens for it, a large amount at that time. It wasn't until the 1800s the painting was called The Night Watch. It can be seen in the Rijksmuseum. In the summer, it's lovely to people watch on the terrace, and see the boats dock and pick up drinks and snacks. The very wealthy Trip brothers, weapon dealers, lived in this enormous house. Rembrandt painted their parents Jacob and Margaretha in 1661. Nowadays, it houses the Dutch Academy of Sciences. This 14th-century building used to be a city gate. It has since been in use in many ways, shapes and forms, but the most interesting one was as an anatomical theatre. Once a year, a criminal would be dissected here. 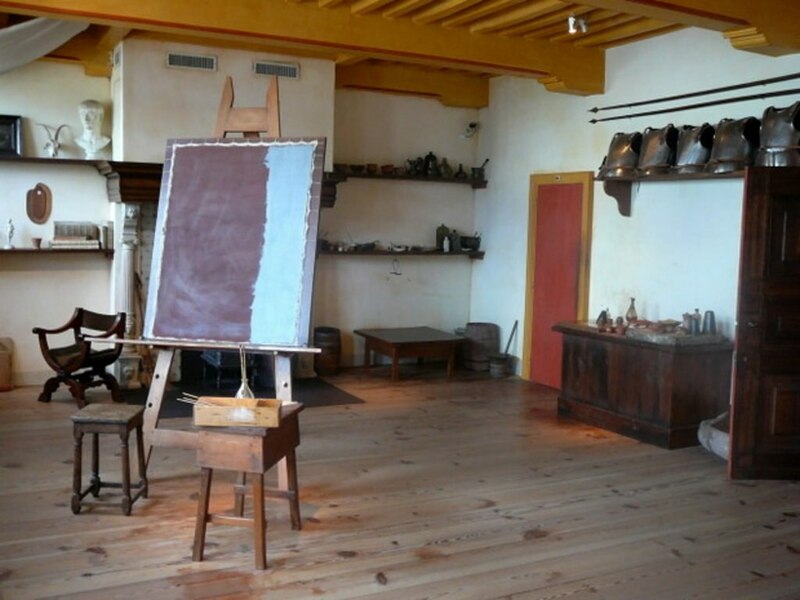 This is where Rembrandt painted 'The Anatomy Lesson of Dr. Nicolaes Tulp' in 1631. It also used to be the backdrop to many public executions in the early 19th century. Take a little breather and go to one of my favourite places for brunch and high teas: De Bakkerswinkel. Try one of their pies, you deserve it after the walk so far. 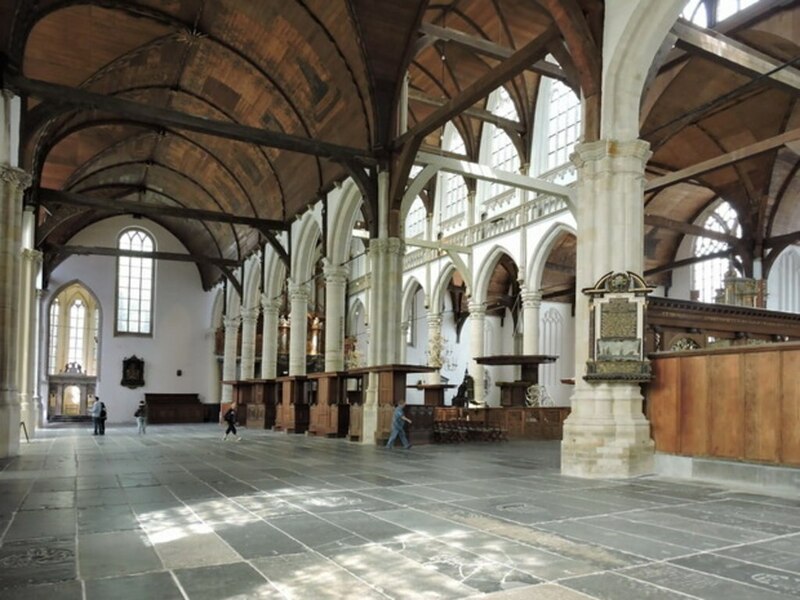 This is the church where Rembrandt announced his wedding to his wife Saskia. She died just eight years, presumably of tuberculosis. She was buried here, but in 1662 Rembrandt sold her grave, because he was in desperate need of money. Rembrandts life was a rather tragic one. After his wife Saskia died at just 29 years of age, his second partner Hendrikje died as well, in 1663. He buried her in Westerkerk, where his son was laid to rest five years later. A year after this Rembrandt died, by then he was so poor that he was buried in a nameless grave. In the last stages of his life, Rembrandt was a poor, broken man. He'd been forced to sell his beloved home in 1656, and, crippled by debt, he moved to a much smaller house a fair bit away in 1659. The last decade of his life was spent here; a painter whose fame was long forgotten, his paintings out of style, and his wealth long gone. While his end may have been sad, the finish of the tour isn't. 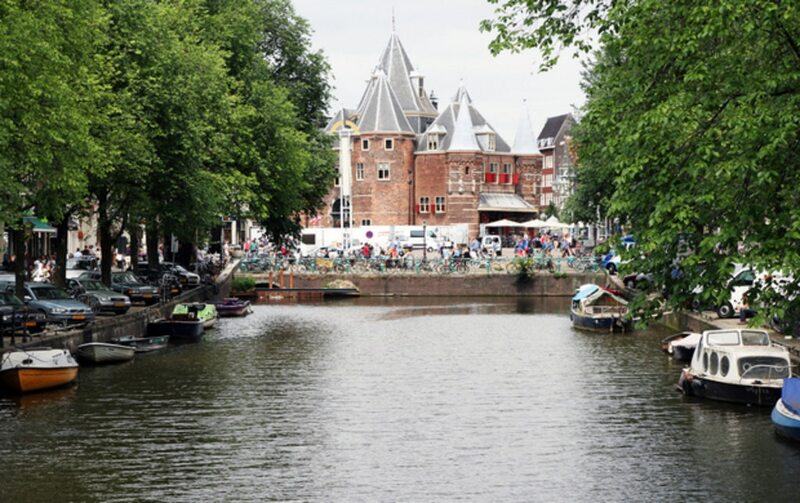 You are now in the Jordaan area, one of the most fun areas in Amsterdam. And if you're hungry, I suggest you sit down at Moeder's, where you can try some Dutch cuisine. To make it easy, here's the route map for you. (Based on the Rijksmuseum's Walking with Rembrandt trail).